When this warning lamp comes on, accompanied by an audible signal and a message, it indicates that there is a fault with the ABS, which could cause loss of control of the vehicle when braking. When this warning lamp comes on, coupled with the STOP warning lamp, accompanied by an audible signal and a message, it indicates that there is a fault with the electronic brake force distribution (EBFD), which could cause loss of control of the vehicle when braking. You must stop as soon as it is safe to do so. In both cases, contact a PEUGEOT dealer or a qualified workshop. When changing wheels (tyres and rims), make sure that these are approved for your vehicle. Normal operation of the ABS may make itself felt by slight vibrations of the brake pedal. 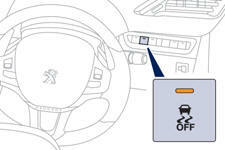 In emergency braking, press very firmly without releasing the pressure.